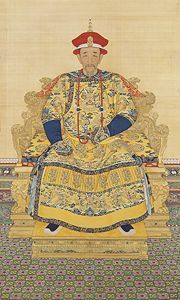 Emperor Kangxi (r. 1661-1722), the Chinese monarch who banned Catholic missionary activity in China (following the conclusion of the Rites controversy). The Chinese Rites controversy (ca. 1630-1715 C.E.) was a dispute within the Roman Catholic Church about whether certain elements of Chinese folk religion (including ancestor veneration, devotional practices at Confucian academies and the various rites and ceremonies of the Imperial cult) should be considered idolatrous. The original Jesuit missionaries led by Matteo Ricci had initially been relatively open to these traditional rites as they sought to create a Chinese version of Christianity instead of trying to replicate a European church. This attitude came to be criticized by other rival missionary orders. Ultimately, Pope Clement XI (r. 1700–1721) decided in favor of the Dominicans (who argued that traditional Chinese practices were incompatible with Catholicism), a ruling which greatly angered the Chinese and made Catholic missionaries unwelcome in the country. Though the official status of the Chinese mission (and the role of Chinese rites among converts) remained uncertain for the next twenty years, the matter was decisively resolved in 1742, when Benedict XIV issued a Papal Bull (Ex quo singulari), which "confirmed and reimposed in a most emphatic manner" the conclusions reached by Pope Clement in 1715. It is hard but necessary to distinguish between the essence of a religion and the different cultural expressions it can take. At the time for understandable reasons, Christians in Europe seemed to have forgotten that their version of Christianity was itself a blending of Judaism with Greek philosophy and culture never mind other pagan accretions such as Christmas trees and Easter eggs. Most specifically, this contention was related to a general disagreement between Dominican and Jesuit missionaries over the propriety of adopting (or at least permitting) local practices among converts. To some extent there was an unfortunate element of envy, rivalry and disunity involved which sullied the image of Jesus and Christianity. The terms of this debate have also led to centuries of Western scholarly speculation on whether Confucianism should "correctly" be classified as a religion or a philosophy—a notably imperialistic debate that ignores the fact that this question would be either meaningless or "unaskable" to the majority of Chinese people. For historians the lingering question is how the world might be today if the outcome of the controversy had been different. In the latter half of the sixteenth century, missionaries from the Society of Jesus (Jesuits) received papal sanction for establishing a mission in China, and embarked upon the lengthy and strenuous voyage to the Far East. In their quest to establish converts, these monks thought it would be expedient to first learn about local customs, in order to better understand the forms of proselytizing that would be most effective. At first, Matteo Ricci and his associates believed that Buddhists were the "ranking" ecclesiastical hierarchy in the region, which impelled them to shave their heads and don the brown robes of the local monks (as a means of adapting to local customs). After learning the local language, however, they discovered that the Buddhists were not held in high esteem by the majority of Chinese (especially in light of the Neo-Confucian revival that was then under way). With this realization, the Jesuits then began to legitimize their presence by adopting the dress and comportment of local Confucian elites, going so far as to begin studying and translating the Five Classics and Four Books. This Poyson [poison] began at Court, but spread its infection thro' all the Provinces, and corrupted every Town: so that this great body of Men already spoiled by Magick and Impiety, was immediately infected with Idolatry, and became a monstrous receptacle for all sorts of Errors. Fables, Superstitions, Transmigration of Souls, Idolatry and Atheism divided them, and got so strong a Mastery over them, that even at this present, there is no so great impediment to the progress of Christianity as is this ridiculous and impious Doctrine. Rather than denying the fact that the idea of divinity can be found in the Chinese classics because it is not conceptualized in the way of a Christian God, Ricci went out of his way to prove that it is not only there but may even be thought about in a European way. "Of all the pagan sects known to Europe," he explains to his European audience, "I know of no people who fell into fewer errors in the early ages of their antiquity than did the Chinese." "From the very beginning of their history," he says, "it is recorded in their writings that they recognized and worshipped one supreme being whom they called the King of Heaven, or designated by some other name indicating his rule over heaven and earth." This positive characterization of Confucianism (and of the compatibility between the indigenous tradition and Christianity) was echoed in Le Comte's travel memoir, where he argued that "China for two thousand years had the knowledge of the true God, and have practised the most pure Morality, while Europe and almost all the World wallowed in Error and Corruption." The zealous French Jesuit goes so far as to suggest that the Chinese "did honour their Maker in such a manner as may serve both for an Example and Instruction to Christians themselves." The work of evangelization, of making Christians, should be carried on both in Peking and in the provinces… following the methods of pacific penetration and cultural adaptation. Europeanism is to be shunned. Contact with Europeans, specifically with the Portuguese in Macao, should be reduced to a minimum. Strive to make good Christians rather than multitudes of indifferent Christians…. Eventually when we have a goodly number of Christians, then perhaps it would not be impossible to present some memorial to the Emperor asking that the right of Christians to practice their religion be accorded, inasmuch as is not contrary to the laws of China. Our Lord will make known and discover to us little by little the appropriate means for bringing about in this matter His holy will. This respect for local customs, laws and traditions allowed the Jesuits to ingratiate themselves with the local elites, which eventually earned them access to the Imperial Court. Of course, their acceptance likely had as much to do with their impressive knowledge European artistic techniques, astronomy and mechanics. For example, they earned the Emperor's favor by assisting him in successfully predicting eclipses, which was one of the ritual duties. These advances caused the ruler to appoint members of the missionary group to administer the Imperial Observatory. Other Jesuits functioned as court painters. In these cases, and in spite of the group's religiously imperialistic agenda, the Jesuits were able to become functioning and respected members of Chinese society. The Kangxi Emperor (r. 1661-1722), who was considered by many to be one of China's greatest, was at first friendly to the Jesuit Missionaries working in China. Indeed, by the end of the seventeenth century, they had made many converts to their religion—all with the explicit approval of the Chinese political authorities. The Europeans are very quiet; they do not excite any disturbances in the provinces, they do no harm to anyone, they commit no crimes, and their doctrine has nothing in common with that of the false sects in the empire, nor has it any tendency to excite sedition…. We decide therefore that all temples dedicated to the Lord of heaven [the Christian God], in whatever place they may be found, ought to be preserved, and that it may be permitted to all who wish to worship this God to enter these temples, offer him incense, and perform the ceremonies practised according to ancient custom by the Christians. Therefore let no one henceforth offer them any opposition. As the Jesuits were a missionary order, their primary goal in traveling to China was convert the populace. As described above, Matteo Ricci's approach was to proceed under the assumption that Roman Catholicism and Chinese folk religion (particularly the practices of ancestor veneration and the popular observances related to Confucianism) were compatible. The Jesuits tried to argue, in Rome, that these "Chinese Rites" were social (not religious) ceremonies, and that converts should be allowed to continue to participate. Unfortunately, Ricci's position was not unilaterally held by all members of the Order, including his successor (Nicolas Longobardi)—a fact that the Vatican was quick to hold against the Jesuits in its attempt to address to controversy. From 1645 to 1704, the Vatican issued various encyclicals and edicts concerning the rites controversy, with rather equivocal results—with their respective contents often depending entirely upon whether they had most recently been petitioned by a Dominican or a Jesuit. In 1704, Clement XI decided against the Jesuit position, and sent a legate to China to inform the fledgling Catholic community of the Papal decision. This ambassador was welcomed by the Emperor "until he learned, perhaps through the imprudence of the legate himself, that one of the objects of his embassy, if not the chief, was to abolish the rites amongst the Christians." After the ejection of the Vatican's messenger (and the Jesuit's willful inattention to his message), the Pope found it necessary to issue a Bull to directly address the matter. Pope Clement XI wishes to make the following facts permanently known to all the people in the world…. I. The West calls Deus [God] the creator of Heaven, Earth, and everything in the universe. Since the word Deus does not sound right in the Chinese language, the Westerners in China and Chinese converts to Catholicism have used the term "Heavenly Lord" (Shangdi) for many years. From now on such terms as "Heaven" and "Shangdi" should not be used: Deus should be addressed as the Lord of Heaven, Earth, and everything in the universe. The tablet that bears the Chinese words "Reverence for Heaven" should not be allowed to hang inside a Catholic church and should be immediately taken down if already there. V. Whether at home, in the cemetery, or during the time of a funeral, a Chinese Catholic is not allowed to perform the ritual of ancestor worship. He is not allowed to do so even if he is in company with non-­Christians. Such a ritual is heathen in nature regardless of the circumstances. This conclusion was then ratified and reiterated in 1742 by Benedict XIV, in his papal bull Ex quo singulari. To avoid a relapse into the debate, Benedict demanded that all missionaries to China take an oath which forbade them from ever discussing the issue again. The Vatican's response to the Rites Controversy soured the relationship between the Christian missionaries and the Chinese (especially with those in the ruling class). Responding to Pope Clement's decree of 1704, the emperor "ordered all missionaries, under penalty of expulsion, to come to him for a piao or diploma granting permission to preach the Gospel. This diploma was to be granted only to those who promised not to oppose the national rites." When the papal legate continued to defy this order, the emperor "ordered Msgr de Tournon [the messenger] to be brought to Macao and forbade him to leave there before the return of the envoys whom he himself sent to the pope to explain his objections to the interdiction of the rites. While still subject to this restraint, the legate died in 1710." Following Clement's concise statement against the rites (quoted at length above), the Kangxi emperor responded by issuing his own decree and expelling all Christian missionaries from China. Catholics are permitted to be present at ceremonies in honor of Confucius in Confucian temples or in schools. Erection of an image of Confucius or tablet with his name on it is permitted in Catholic schools. Catholic magistrates and students are permitted to passively attend public ceremonies which have the appearance of superstition. It is licit and unobjectionable for head inclinations and other manifestations of civil observance before the deceased or their images. The oath on the Chinese rites, which was prescribed by Benedict XIV, is not fully in accord with recent regulations and is superfluous. ↑ Paul Rule, Ph.D., Pacific Rim Report No. 32, February 2004, The Chinese Rites Controversy: A Long Lasting Controversy in Sino-Western Cultural History Retrieved June 12, 2007. ↑ Joseph Brucker, Catholic Encyclopedia - Matteo Ricci newadvent.org. Retrieved June 12, 2007. ↑ Xinzhong Yao. An Introduction to Confucianism (Cambridge: Cambridge University Press, 2000), 1-2. ↑ Louis Le Comte. Memoirs and observations topographical, physical, mathematical, mechanical, natural, civil, and ecclesiastical, translated from the French. (London: printed for Benjamin Tooke at the Middle Temple Gate in Fleetstreet, 1698), 323. ↑ Matteo Ricci, quoted in Yu Liu, "Seeing God Differently: Chinese Piety and European Modernity," History of Religions Volume 45 (2005), 29–44, 35. ↑ As cogently argued in Yu's excellent article (2005). ↑ Matteo Ricci, quoted in George Dunne. Generation of giants; the story of the Jesuits in China in the last decades of the Ming dynasty. (Notre Dame, IN: University of Notre Dame Press, 1962), 55. ↑ S. Neill. A History of Christian Missions. (Harmondsworth: Penguin Books, 1986), 189-­190. ↑ As Ricci argued, "since they do not recognize any divinity in these dead ones, nor do they ask or hope for anything from them, all this stands outside of idolatry, and also one can say there is probably no superstition." Matteo Ricci, quoted in Mark D. Luttio, "The Chinese Rites Controversy (1603-17422): A Diachronic and Synchronic Approach," Worship 68(4) (July 1994): 290-312, 295. ↑ As Ricci argued, "the purpose of this law [the Confucian rite] of the scholars is to maintain the peace and tranquility of the kingdom and the good government of homes and individuals. … Thus, one can belong to this academy and at the same time be a Christian, since it contains nothing that is essentially contrary to the Catholic faith." Matteo Ricci, quoted in Luttio, 295. ↑ 13.0 13.1 Yu, 37. ↑ 14.0 14.1 14.2 Brucker, Catholic Encyclopedia Retrieved June 12, 2007. ↑ Dun Jen Li (translator), China in Transition (1517-­1911) (New York: Van Nostrand Reinhold Company, 1969), 22-24. ↑ Henri Cordier, Catholic Encyclopedia - The Church in China Retrieved June 12, 2007. ↑ China in Transition (1517-­1911), 22. ↑ S.C. Prop. Fid., 8 Dec., 1939, AAS 32-24. Dun Jen Li (Translator). China in Transition (1517-­1911). New York: Van Nostrand Reinhold Company, 1969. Le Comte, Louis. Memoirs and observations topographical, physical, mathematical, mechanical, natural, civil, and ecclesiastical, Translated from the French. London: Benjamin Tooke at the Middle Temple Gate in Fleetstreet, 1698. Electronic reproduction. Digital version of: Early English books, 1641-1700. (Ann Arbor, MI: 1991), 15. Luttio, Mark D. "The Chinese Rites Controversy (1603-1742): A Diachronic and Synchronic Approach." Worship 68(4) (July 1994). Rule, Paul. Pacific Rim Report No. 32, February 2004, The Chinese Rites Controversy: A Long Lasting Controversy in Sino-Western Cultural History Retrieved June 12, 2007. Yu Liu, "Seeing God Differently: Chinese Piety and European Modernity," History of Religions Volume 45 (2005), 29–44. Cordier, Henri, Catholic Encyclopedia, 1908, The Church in China newadvent.org. History of "Chinese Rites Controversy"
This page was last modified on 13 February 2017, at 17:18.